If you've ever created a Gmail account, you've probably seen the density setting at some point during that time. It's a simple option to choose one of three different levels of information density for the overview list. Options include: default, comfortable, and compact. 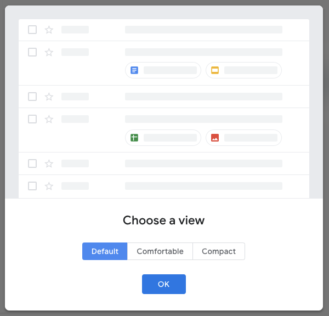 While the Gmail app offers many of the same options as the web interface, this one is not included, but it looks like it will be soon. Three strings were added with names matching the three layout options from the web. Examples of the three different modes from the web interface. The strings are currently empty, but it's not hard to see what will be in there. Nevertheless, we'll likely see these options going live in the future, not with this update. It's something to look forward to if you prefer either of the styles that aren't currently offered in the Android app. This update was really light on changes, and most of what changed was actually the removal of some unnecessary text that resulted in a drop of about 300KB in the APK. Nevertheless, there are a couple small additions to note. 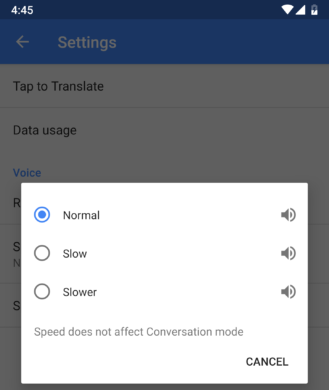 According to a new line, there are new speed options for the speech output. This isn't actually true, or at least not yet, so it looks to me that this is a plan for the future. The current options are: Normal, Slow, and Slower. My assumption is that Google will be adding some faster options... but I guess we can't rule out "Ultra Slow." The Play Books app hasn't been particularly active for the last few months, but the updates appear to have been centered around bug fixes and other improvements behind the scenes. 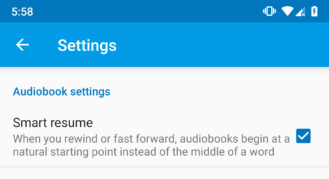 The latest update is preparing a settings screen for audiobooks playing in the car. The activity for this screen is actually exported, so it can be freely launched with adb or an app. At this time, the settings screen only contains a toggle for the Smart Resume feature. This modifies the forward and skip buttons so they will jump to the start of a sentence rather than in the middle, making the context of the jump a little more clear. I expect more options to be added in time, but this is it for now. So far the settings screen doesn't appear to be live, but I wouldn't write off the possibility that it will be in the near future. As we've seen before, not all updates to the Google app haves something worth remarking on. Version 8.55 lands squarely in that territory with many minor rephrasings and a lot of similar text that doesn't speak to any new or improved features. It's really not worth dragging our readers in just for some cheap page views. However, there is one bit that was at least a little amusing. It looks like the Google Lens team is looking to bring a few more people into the circle. A promotional messages shown to other Googlers includes the words, "We're hiring!" The purpose is quite obviously aimed at cannibalizing developers from other teams. From what I'm told, this isn't an uncommon practice within the company, but it's fairly rare that messaging like this materializes right inside of an app. Last week, we discussed an upcoming feature that will allow users to share their collections with other people. There's nothing substantial here, but there is now a title for a screen that will list all of the collections that have been shared with you. At least this offers a bit more insight into the experience of looking at collections from other people. 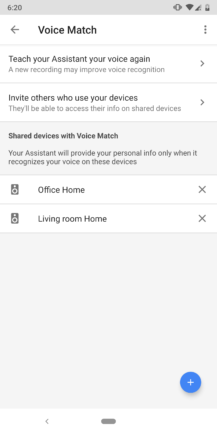 The latest Google Home update received a few changes, but they felt suited to a quick overview with screenshots rather than a dedicated post. 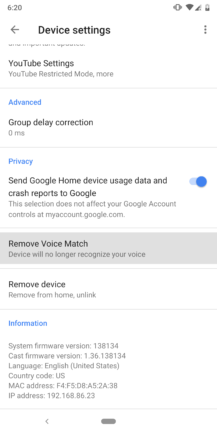 There is now an option to remove your Voice Match profile from Google Home and most other Assistant-enabled devices. 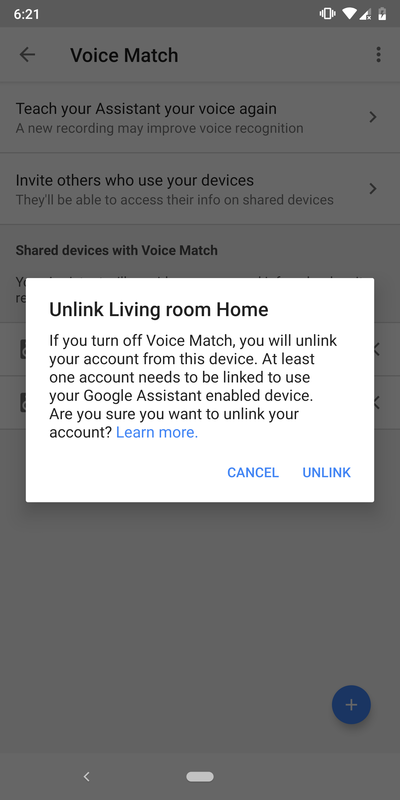 Actually, while that's what the option is called, it really means you're completely unlinking your account from a device. 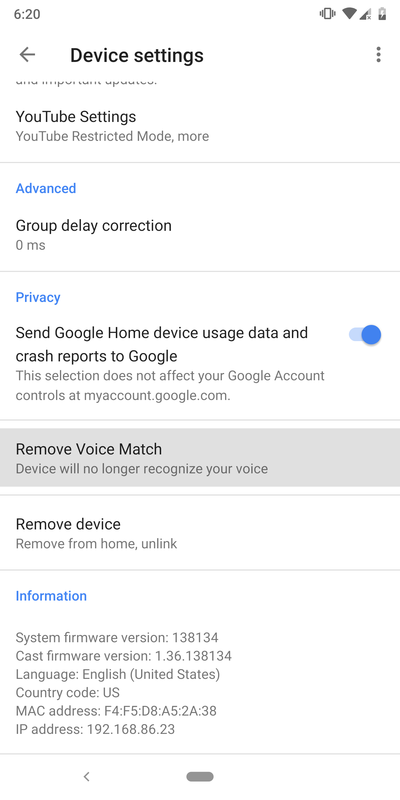 This is something you've been able to do in the past from the Voice Match screen, but now there's a new shortcut to get you to the same place. Like most updates, there are a few cosmetic changes. 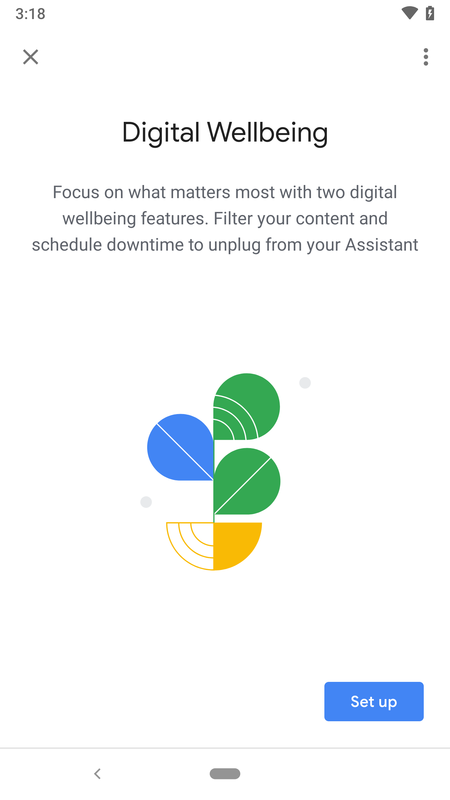 This time it looks like most of them are appearing in setup screens, like the ones above for Digital Wellbeing. — Thanks, QikOver. If you're the proud owner of a smart display, you should now have a new setting to control the minimum brightness of the screen. You'll have four options: Brighter, Bright, Dim, and Dark. And finally, there is a lot of new text and some new activities related to configuring Wi-Fi networks. It's not entirely clear if this will be for configuring which Wi-Fi networks are to be used, but among the strings are a few related to mesh networks, so it may also be used for managing settings and pairings for devices that either connect to or extend mesh deployments. Since the redesigned Google Fit came out in August, not much else of note has happened with the app. Nevertheless, there still some bits of activity worthy of a mention, even if it's just to show there's something happening behind the scenes. Two new activity types were added in the last couple of updates. The first was for guided breathing, which appeared in v2.04, and the latest update to v2.05 added sleeping. Notably, these don't appear to be visible activities anywhere in the app yet, but we'll obviously see them going live at some point in the future. Motivational words have been shown to help get people moving, and Google Fit has always made a point of using that strategy. There's nothing too unusual about it, but there are four brand new sets of messages that will be used to give positive reinforcement for good workouts. They are broken into small, medium, large, and mega workouts. 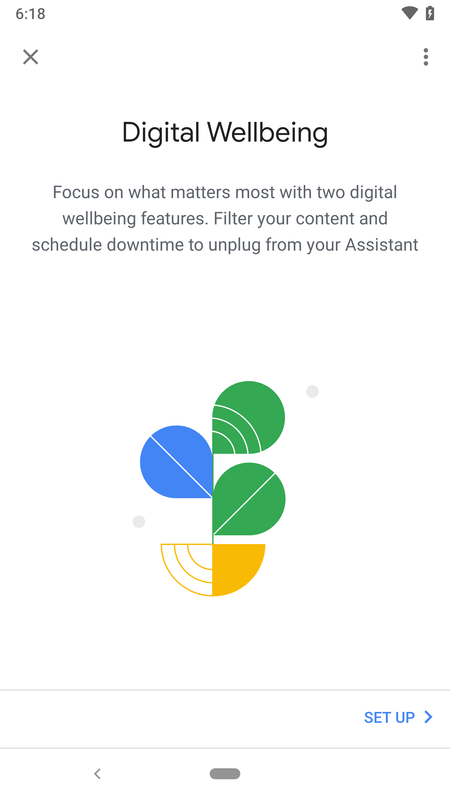 And perhaps related to this, Google Fit's advisory features may begin either suggesting workouts or asking users to evaluate workouts based on their intensity level. Low, moderate, and high intensity levels are named, and each comes with a basic description of the effects from such a workout.